Photocopy of word processor typed print-out. 8vo, [ii] + 53 pp. Good. In plastic binder. Title carries Dee's address. Second page lists the twelve sections of the play. 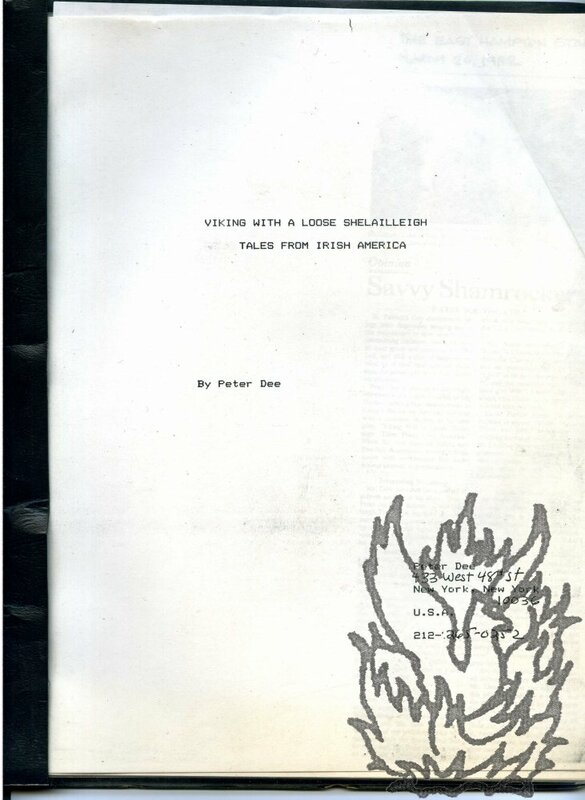 Loosely inserted is a photocopy of a long review, with photograph, from the East Hampton Star, 26 March 1992, of 'a dramatic reading' of the play at Canio's Books, Sag Harbor. 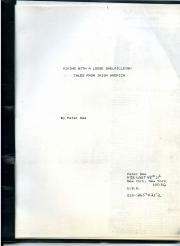 The play was not published, and there are no copies of this item on WorldCat or COPAC. Small collection of material relating to 'Music Today', comprising two advertisements, the programme for the inaugural concert, and a Typed Letter Signed from Hamilton to V. W. A. Conn, with the autograph draft of Conn's letter to Hamilton. All items dating from 1960. For more information relating to this influential series of concerts, see 'Pursuit: The Uncensored Memoirs of John Calder' (2001). Seven items, including two duplicates. Text of all items clear and complete. In fair condition, but with one side of a duplicate advertisement heavily sunned (see below). 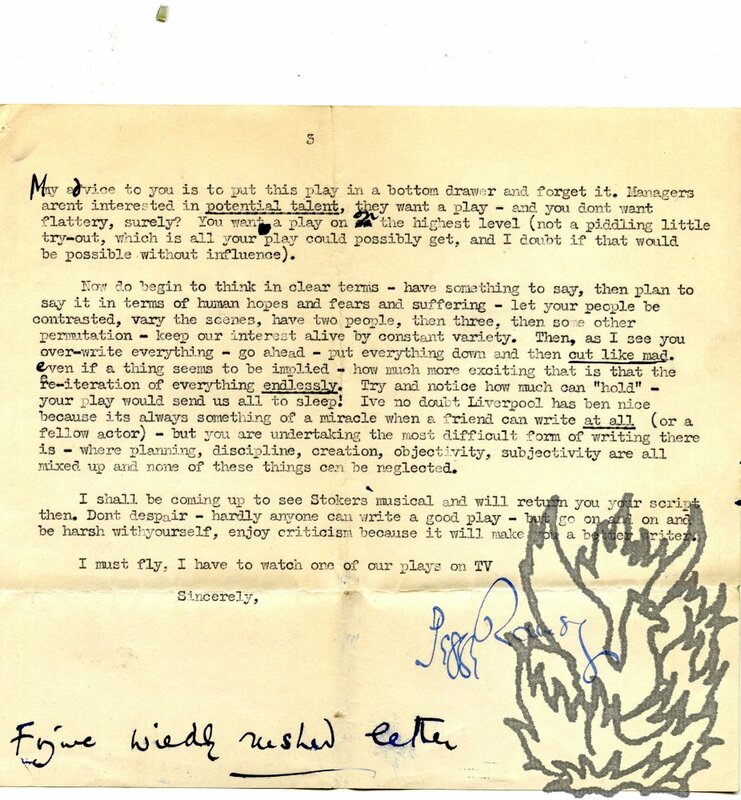 ONE: Typed Letter Signed ('Ian Hamilton') from Hamilton to Conn (husband of the poet Jeanne Conn), 12 February 1960. 4to, 1 p. Eighteen lines. Responding to Conn's criticisms, explaining reasons for cutting short discussion and cancelling part of the programme, and giving future plans. Autograph Letter Signed ('J. H. Barnes'), to the leaseholder of the Prince of Wales Theatre, concerning his desire to become a tenant. 24 November 1899; on letterhead of 25 Finchley Road, London, N.W. 4to, 2 pp. Text clear and complete. On aged and lightly-creased paper. 'The nature of my business is a desire to become a tenant of the Prince of Wales Theatre, for a long or short time, and entirely subject to existing arrangements in order to produce a play which good judges (as well as myself) regard as one (if not the) play of the present generation'. The name of the play is not given. Barnes states that 'if Mr Harvey is your permanent tenant it would quite suit me to do the play at any time <?> another provincial Town'. He offers 'a short or long lease [...] with unimpeachable security'. Autograph Letter Signed ('E. Ratmirova') to 'Mr. Bass' of Manchester, regarding the play 'The Fold'. 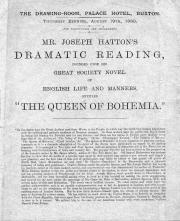 5 April 1920; on letterhead of the Queen's Theatre, Shaftesbury Avenue. 4to, 2 pp. Fair, on aged and lightly-creased paper. The play 'is a great success in London and is likely to have a long run there, yet at the same time we are all looking forward to coming back to Manchester, where the play started and everybody was so kind to us'. She concludes with some graceful compliments to Bass, and encloses her portrait (not present). Manuscript list of British subscribers' names, headed 'Nightingale Fund. | Subscription to present Madame Jenny Goldschmidt-Lind with a Marble Bust of the Queen'. 4to, 3 pp. Bifolium. Text clear and complete. Fair, on aged paper, with minor evidence of the letter having been laid down on the blank reverse of the second leaf. Thirty names, with sums subscribed. The list is headed 'The Lord Mayor (Salomons) 5. - [five pounds]'. (David Salomons was Lord Mayor of London in 1855.] Several of the names are ticked in pencil, with another noted as 'Not paid' and another as 'Dead'. Among the subscribers is the poet Martin Farquhar Tupper (one pound). Jenny Lind had raised money for the "[Florence] Nightingale Fund". Autograph Letter, in the third person, to Mrs Wallack, on the occasion of the Wallacks' Paris performances. 15 June 1855; 13 Rye Beaujon (on letterhead of the Paris Legation of the United States). 4to, 1 p. Twenty lines. Text clear and complete. On aged and lightly-creased paper. Responding to 'the kind note of his esteemed Country woman Mrs. Wallack'. He is 'gratified to learn, that Mr. Wallack will present to the Parisian public representations in the English language, of the best of our Tragedies & Comedies'. He wishes the Wallacks 'the most complete success, and will with pleasure attend the performances, when his health will permit him & his family to do so'. Two of Mason's family will take up Wallack's offer of tickets for the opening. Autograph Letter Signed ('E. A. Sothern') to 'Davis'. Undated. On letterhead of the Theatre Royal, Haymarket. 12mo, 2 pp. On bifolium. 12 lines. Text clear and complete. Good, on lightly-aged paper. Part of the leaf to which the item was attached in an autograph album adhering to blank part of reverse of second leaf. 'Miss Cross' has written to him again, 'desiring me to use my influence in obtaining an engagement for her. - She states she is "quite disengaged now" '. Sothern states that when she made a similar request on a previous occasion 'there was some little misunderstanding', so he considers it best to 'drop you a line'. 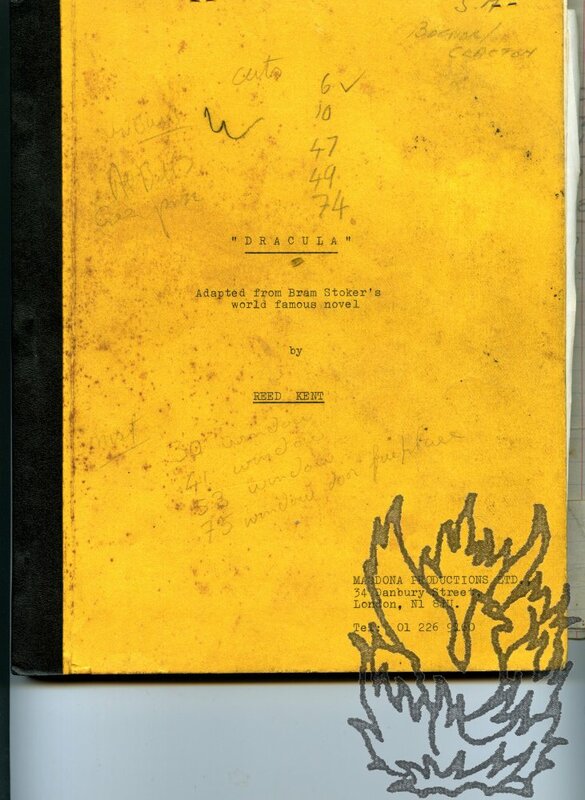 The theatre director's copy of a bound typescript of a provincial production of ' "DRACULA" Adapted from Bram Stoker's world famous novel by REED KENT'. 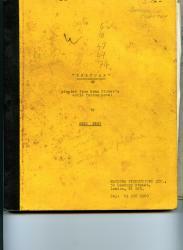 With manuscript emendations and additions, including stage plan. Dimensions 25 x 20 cm: [ii] + 87 pp, all on rectos. Bound in stained yellow wraps, with black tape spine. Well-thumbed, but in fair condition internally, tight, clear and complete. The names of the eight actors are added in pencil in the list of characters. In the first six cases only the christian names are given ('Dracula' is given as 'Alan'), but 'Professor Abraham van Helsing' is played by Andrew Turner, and 'Lucy Westenra' by Jannina Tredwell (who featured in a 1974 revival of the musical 'Hair'). 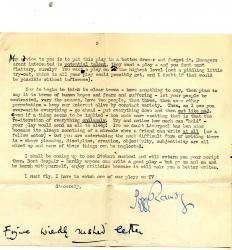 Four Typed Letters Signed (three 'Peggy Ramsay' and one 'Peggy R.') to Goodman, giving her characteristically forthright opinion of his plays. 29 May 1955, and 5 and 12 March and 19 April 1956. All on letterheads of Margaret Ramsay Ltd, Play Agent. All four items good, on lightly aged paper. Two of the five leaves have small dog-ears to corners. Goodman has done his accounts on the blank reverse of one leaf. An important collection, in which the most important British post-war play agent reveals, in entertaining and increasingly-brusque terms, the criteria by which she judges scripts. Goodman was hailed by Jacques Barzun as 'the greatest living master of true-crime literature', but his first love was, as his obituary in the Daily Telegraph (16 January 2008) states, the theatre. 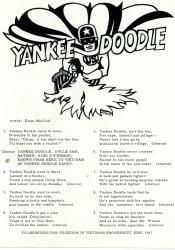 Playbill 'For the Benefit of The Charity Schools. At the Theatre in Colchester, By His Majesty's Servants, from the Theatre-Royal, Norwich'. Performance of 'Such Things Are' and 'The Widow's Vow'. On Monday, October 29, 1787'. On one side of a piece of laid paper, 25 x 17.5 cm. Text clear and complete. Aged, foxed and creased. Giving casts of the two plays (the first headed by 'Mr. Waddy' as 'Twineall'; and the second by 'Mr. Inchbald' as 'Don Antonio'. After the first cast list: 'End of the PLay, an Address in the Character of The Genius of Charity. To be spoken by Mrs. Sharpe.' At foot: 'Tickets too be had at W. Keymer's Printing-Office; and Places for the Boxes may be taken at the Theatre from Ten to Twelve o'Clock each Day. Scrapbook of material collected on a trip to Scotland for the 1958 Edinburgh International Festival, including letters, programmes, tickets, maps, postcards, newspaper cuttings. Around 140 items, laid down on 53 pp of a contemporary 37 x 25 cm stapled scrapbook. In original red and orange wraps, with 'Edinburgh Festival 1958' in manuscript on front cover. The collection is in good condition, on lightly-aged paper, with occasional items a little discoloured from mounting. The scrapbook itself is slightly grubby and ruckled. Collected by Victor Conn of Eltham, London, who was presumably responsible for the neat captions to some newspaper cuttings and other items. Wien [Vienna], 27 [?] 1923. 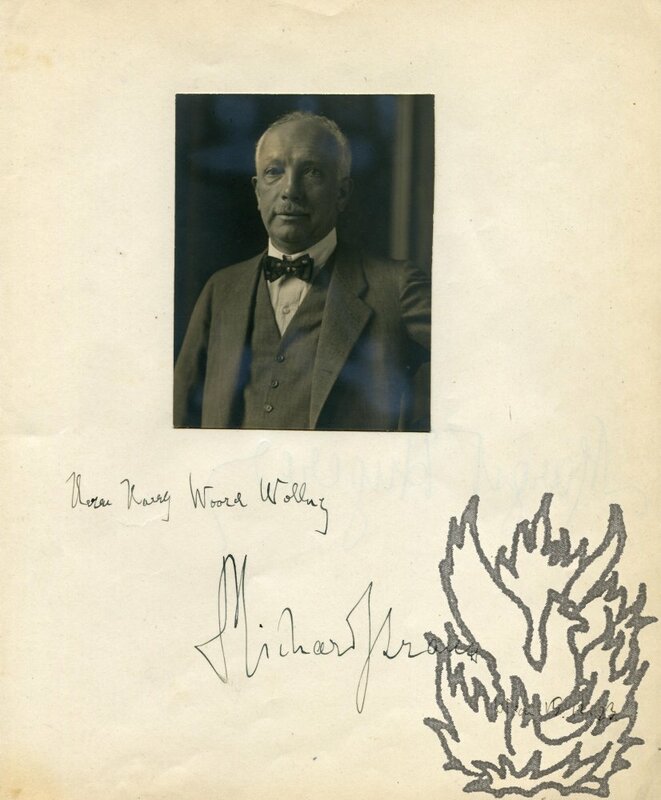 Photograph (upper body, seated and besuited), c.8 x 13cms, characteristic signature beneath with place and dat, all in Lehar's hand, on page extracted from an album of autographs accumulated by Harry Woord Wolling, BBC producer (?). Suitable for framing. 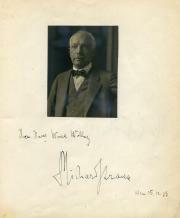 Photograph, 7.5 x 10cms, with inscription appended by Strauss. On page extracted from an album of inscriptions with photographs by composers, actors, etc. Good condition. Inscribed by Strauss as follows: "Herr?] Harry Woord Wolling / Richard Strauss / Wien 15.12.23". The signature is bold. Scan provided on request. Autograph Signature ('Charlotte H Dolby') on fragment of letter. Dimensions roughly two and a half inches by four and a half wide. Clear, bold signature on aged paper. Reads '<...> believe me Gill's friend as well as your own | [signature] Charlotte H Dolby'. Reverse reads '<...> says, because I get mixed up with such a lot of people, and lose my individuality in the <...>'. Cut from a letter. On small rectangle of light-grey paper, roughly 2 x 4 cm. Fair, on aged paper with thin light strip of glue staining along top edge. Neat firm signature, underlined and overlined, reading 'John Hullah'. Autograph Signature ('Albert Chevalier') with quotation from his song 'Our Bazaar'. On a piece of paper 6 x 14 cm. Laid down on part of leaf from autograph album. Good, on lightly-aged paper. Evidently in response to a request for an autograph. Good firm signature, with looped underlining. Reads: ' "We take the compositions as they are" | "Our Bazaar" | [signed] Albert Chevalier'. Chevalier's song 'Our Bazaar' was hugely popular. The published version (1894) gives the authors as Chevalier and Brian Daley, but the British Library ascribes it to John Charles Bond Andrews. 4to, 8 pp. Stitched pamphlet on grey paper. Text clear and complete. Good, though somewhat creased, and a little stained. In small type. Divided into two sections: 'Selections from the opinions of the London press' and 'Selections from the opinions of the provincial press'. 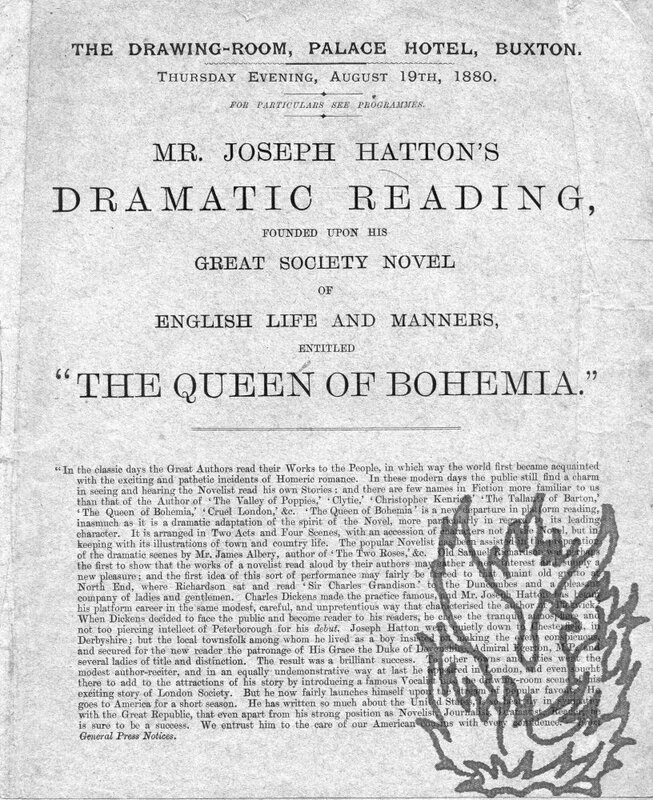 In a long quotation on the front page: 'Charles Dickens made the practice famous, and Mr. Joseph Hatton has begun his platform career in the same modest, careful, and unpretentious way [...]'. (p.1, 'From General Press Notices'). Scrapbook containing a hundred tickets from twenty-seven London theatres of the 1920s, with illustrations of actors. London: for performances dating from between 1922 and 1927. On fifty-seven pages, in a notebook of forty leaves (eighty pages). Dimensions: 20 x 16 cm. In red card covers with 'THEATRES' in manuscript on front. Pages aged and ruckled, with a little damp staining at rear (not affecting any of the ephemera) and a small amount of loss to a corner of the rear cover, but in fair condition overall. The first page, signed 'R. J. Olive', with title 'London Theatres'. Typed Letter Signed and Autograph Card Signed (both 'Steuart Wilson'), one to K. W. Luckhurst, Secretary, Royal Society of Arts, and the other to Luckhurst's assistant. With copies of four Typed Letters from Luckhurst and his assistant to Wilson. The six items from 1948 and 1949. 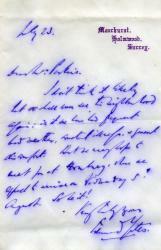 Wilson's letter on BBC letterhead. The six items good, on aged paper, with the copies of Luckhurst's letters lightly creased. Item One: Copy of Luckhurst to Wilson. 5 October 1948. 4to, 1 p. Asking whether Wilson 'would honour the Society by consenting to deliver the third [Cantor] lecture for which the title "Music - and the Audience" is suggested. [...] the first lecture in the series will be given on March 22nd by Mr. Benjamin Britten, and the second on March 29th by Sir Malcolm Sargent.' Gives details of arrangements and fee. Item Two: Wilson to Luckhurst. Typed Leter Signed. 8 October 1948. 12mo, 1 p.
Autograph Note Signed to unnamed male correspondent. Edith Coates (1908-1983), English mezzo-soprano opera singer. Undated; 31 Makepeace Avenue, Highgate, London. 12mo, 1 p. Good, on lightly-aged paper. Punch-hole in top left-hand corner. 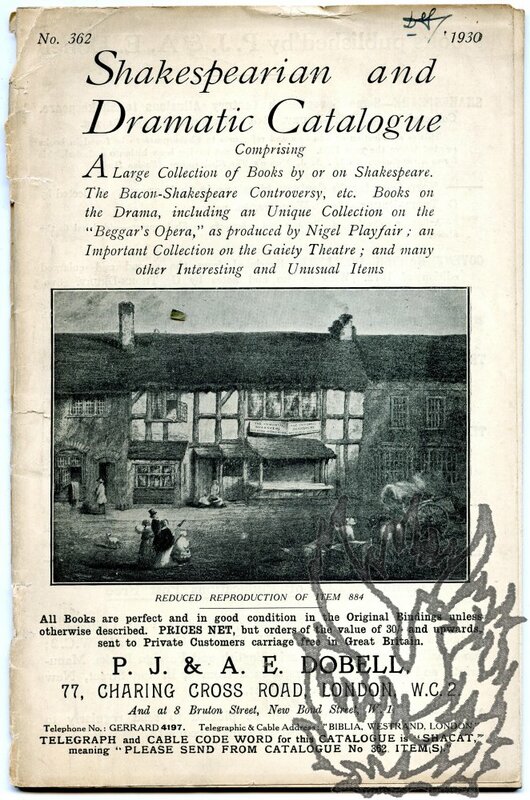 Replying to an autograph hunter, she states that she has 'signed the programme' and has 'much pleasure in returning it with every good wish'. Good, firm signature. 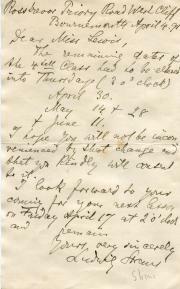 Autograph Letter Signed to Mrs [Cecilia] Perkins. 23 July [no year]; on letterhead of Moorhurst, Holmwood, Surrey. 12mo, 1 p. The purple ink of the letter has bled, otherwise in good condition. He does not 'think it likely that we shall soon see this neighbourhood again'. They have had 'frequent bad weather, constant illness, & general discomfort'. The Yateses 'hope to meet you at Hamburg, where we expect to arrive on Wednesday 5th. August. So be it!' Mrs Perkins was the wife of the wealthy brewer Augustus Frederick Perkins. Berlin: Verlag für Jüdische Kunst und Kultur. Fritz Gurlitt. 1920. Only edition. The dimensions of the volume, which is bound in grey paper printed wraps, are roughly 29.5 x 24 cm. It consists of 25 unpaginated leaves and a frontispiece (sometimes lacking). The other illustrations are eight tipped-in plates and a facsimile of a music score. Some ruckling to the wraps, otherwise a good copy on lightly-aged paper. 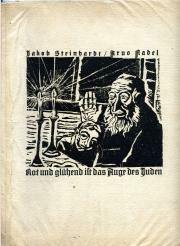 Striking woodcut on front cover, 13 x 16 cm, showing and old Jew with a boy before a table with two candles. 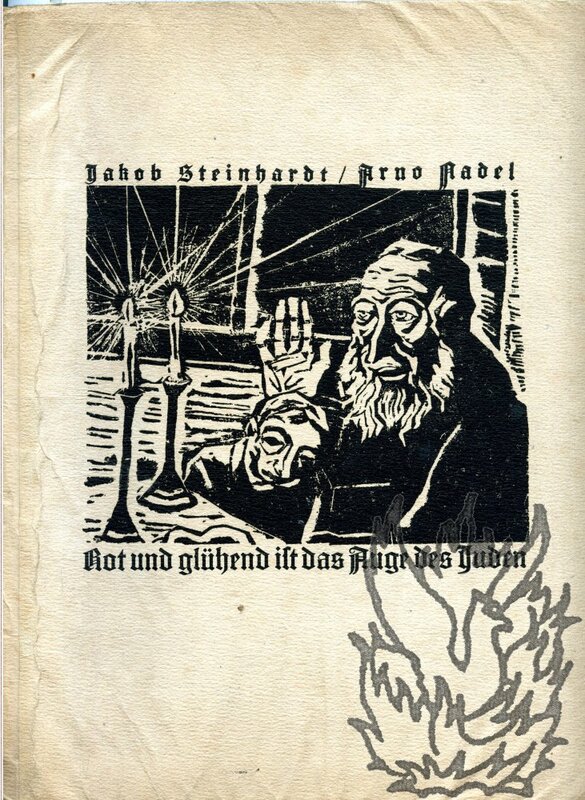 An attractive work, delicately and sensitively illustrated with images of Jews at prayer. 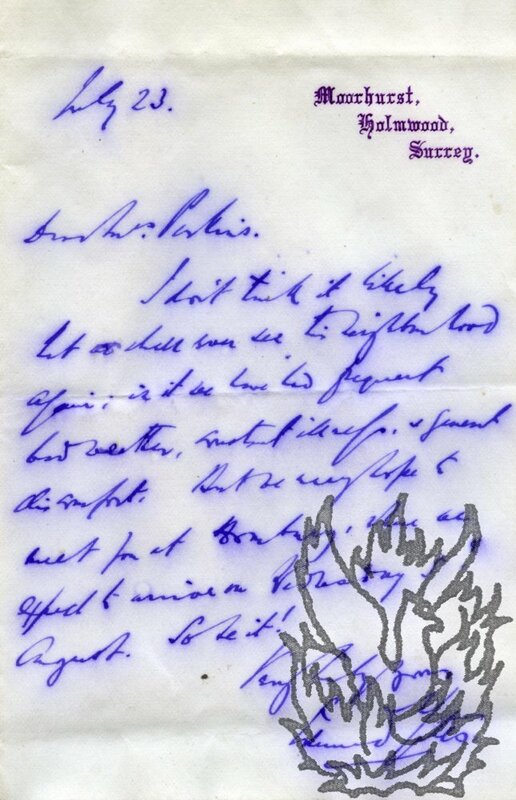 Autograph Letter Signed by Nachez to 'Miss Elsie [Cartwright]'; with part of Norwegian hotel register, containing Lord Randolph Churchill's signature. 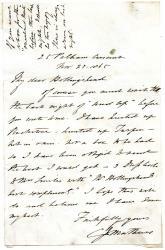 Nachez's letter: 15 August 1889; 80 King's Road, Chelsea, on letterhead of 10 Little Stanhope Street, Mayfair. Hotel register with dates from 1886. Nachez's letter: 12mo, 3 pp. Good, on aged and lightly-ruckled paper. 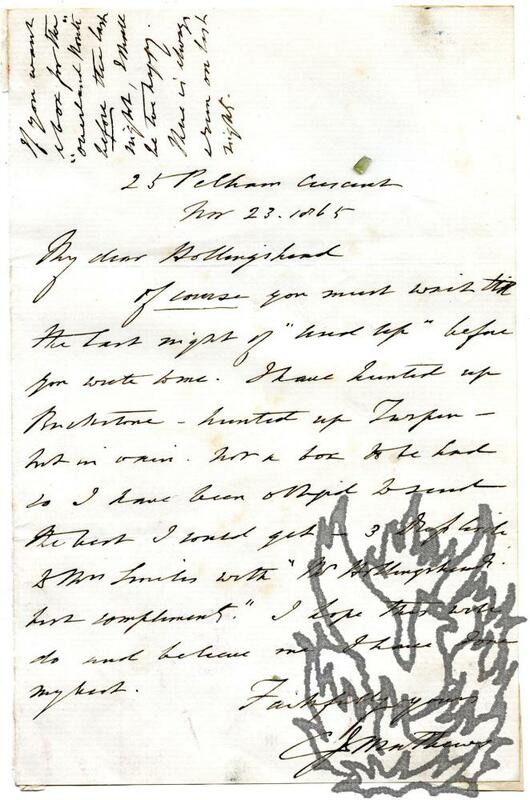 He is keeping his promise and sending the 'autograph of Lord Randolph Churchill, which I found in Norway during my last journey to the midnight sun'. He explains that 'Lord Randolph must have signed his name by his own hand into the Strangers list', because of the 'different handwriting of his private secretary Mr. Wm. Trafford'. 'The slip of paper is out of a book at the Hotel in Trondjhem.' The slip from the hotel register is roughly 8 x 27 cm, with six signatures on each side, including those of 'Dow. 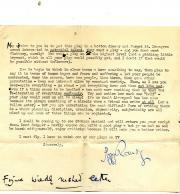 Autograph Letter Signed to 'Miss Lewis'. 4 April 1891; Rosstrevor Priory Road West Cliff, Bournemouth. 12mo, 1 p. Good, on lightly-aged and ruckled paper. He explains that the 'remaining dates of the 4tett Class had to be alterered', given the alternatives. 'I hope you will not be inconvenienced by that change and that you kindly will assent to it.' He gives the date of her next lesson, to which he looks forward. Two broadsheet songs: 'Oh, Brother, did you weep?' 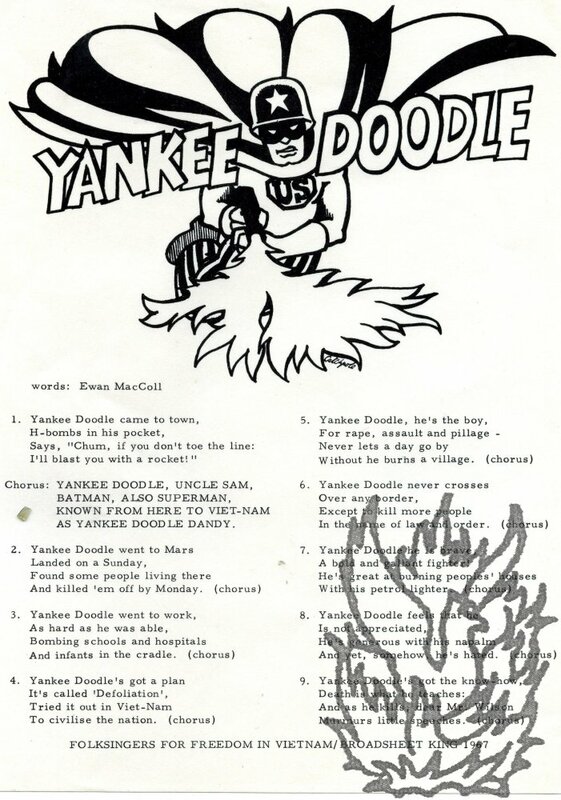 (words and music by MacColl, illustration by Audrey Seyfang) and 'Yankee Doodle' (words by MacColl, and illustration by 'Catchpole'). Both items by 'FOLKSINGERS FOR FREEDOM IN VIETNAM/BROADSHEET KING 1967'. Excessively scarce survivals, with no copies of either item appearing on COPAC or WorldCat. Both are printed on one side of a leaf roughly 25 x 20 cm. In fair condition, with light creasing to extremities. Item One (on grey paper, with illustration by Audrey Seyfang): 'Oh, Brother, did you weep? | words and music by Ewan MacColl'. Four illustrated broadsheets. Three with words and music, to songs: 'Oh, Brother, did you weep?' by MacColl; 'Lament of the Soldier's Wife', 'words: Claudi Paley'; and 'Nam Bo', 'by an American'. The fourth with McColl's words to 'Yankee Doodle'. All four items 'FOLKSINGERS FOR FREEDOM IN VIETNAM/BROADSHEET KING 1967' [London]. According to Karl Dallas (Morning Star, 16 November 2007) it was he who 'first mooted the idea' of an anti-Vietnam War 'campaign in the folk scene', with the 'singers' group' being formed by Dallas in conjunction with Ewan MacColl and Gordon McCulloch. The four items are excessively scarce survivals, with no copies of any of them appearing on COPAC. All are printed on one side of a leaf roughly 25 x 20 cm. Each leaf is differently coloured. The items are in fair condition, dogeared and with light creasing and chipping to extremities. 1930. No. 362. Printed by Robt. Stockwell, Baden Place, Borough, London. 8vo, 72 pp. Stapled and unbound. Complete. On aged paper. The outer leaves are worn and coming apart at the spine. Otherwise the item is sound and tight. 1976 items. Items 783 to 883 concern 'the Bacon-Shakespeare Controversy'. Items 888 to 893 are 'Books from the Library of the late Dame Ellen Terry.' ('Only a few Books from her Library were sold, and Association Books are very difficult to obtain.'). 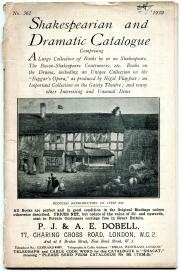 Items 894 to 982 are 'Books on the Drama and Shakespeare, from the library of Henry Arthur Jones'. Items 983 to 1976 are 'Books on the Drama'. Theatre Scrapbook, containing twenty-one Letters from a number of individuals, four Telegrams, Dinner Invitation, Menu Card, and Newspaper Cuttings. The greater part of this collection consists of the responses of the British actor-manager Sir George Alexander (1858-1918) - best known as the first producer of Wilde's 'Importance of being Earnest' and 'Lady Windermere's Fan' - and his representatives to the requests of the scrapbook's compiler, Harry E. King. Twenty-eight leaf quarto scrap book, in which twelve leaves have been used. Items in good condition, with occasional spotting and fading. Album itself, on discoloured, high-acidity paper, in poor condition: binding loose and worn, with damage to spine. 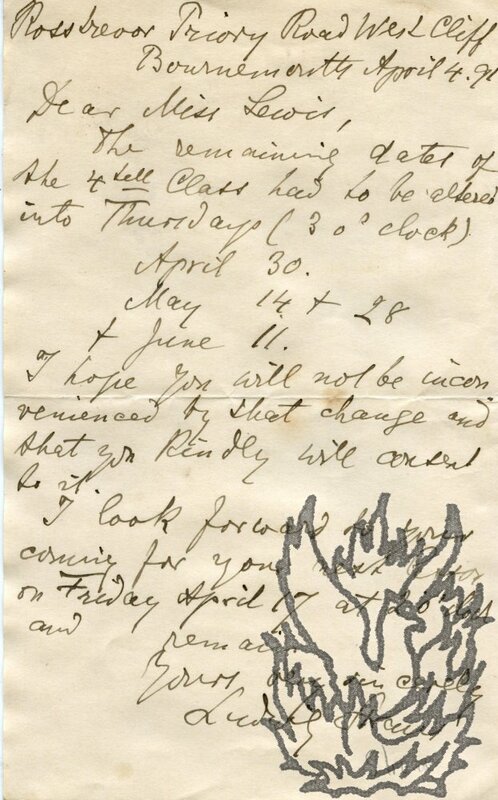 Autograph Letter Signed ('C J Mathews') to Hollingshead. 23 November 1865; 25 Pelham Crescent, London. Autograph Signature ('Charlotte Cushman'), with quotation.